Brody Jackson lives and breathes football. As a wide receiver for a popular arena team, he’s determined to make it back to the NFL. Cocky and confident, he doesn’t have the time or energy to be bothered with a serious relationship until he’s blindsided by a sweet, naive girl who breaks through his defenses. 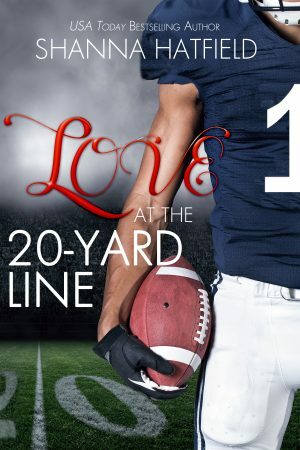 He has to decide if he’ll let go of his dreams or fumble his chance to win Haven’s heart. “I like sweaters. They’re soft and warm and pretty.” Haven had no idea why Brody wanted to discuss her wardrobe selections. It certainly wasn’t what she wanted to do. Pressing her lips to his and seeing if they tingled like they did the first time he kissed her seemed like a much better idea. “Pretty,” Brody repeated, fascinated by the way her lips moved. Most of the girls he’d dated in the past wouldn’t have been caught dead dressed in the modest attire Haven favored. On her, though, the soft, feminine clothes were definitely appealing. He turned his gaze to her hair. His next objective was to remove the hair band binding the golden mane at the back of her head. He’d dreamed of what her hair would look like down, how it would feel with his hands buried in the curls, and he wasn’t leaving until he found out. She reached a hand up to her hair, uncertain how she’d styled it before leaving for the game. When she felt the hair band holding it in a ponytail, she tugged it out and stared at it lying on her palm. Brody took the band from her hand and dropped it on the table next to her glasses. Slowly, he threaded his fingers into her hair. It felt even better than he’d imagined and he drew closer, taking a deep breath, inhaling the sweet scent of it. When she leaned into his hand, he swallowed back a groan. “Haven,” he whispered. His gravelly tone made a shiver rack through her with such force he could feel it. He deepened the kiss and folded her closer in his embrace, discovering a perfect moment of pure happiness. Out of breath and out of her mind, Haven knew she should jump off Brody’s lap and show him to the door. She knew any more of his kisses would render her helpless and hopeless. Despite what she knew, she couldn’t force her languid limbs to move any more than she could force herself to focus on anything except how right it felt to be held in Brody’s strong arms.